Venom Racing - 6V 1600mAh NIMH Flat Battery for Receivers Discounts Apply ! VNR1503 - Venom Racing 6V 1600mAh NIMH Flat Battery for Receivers. 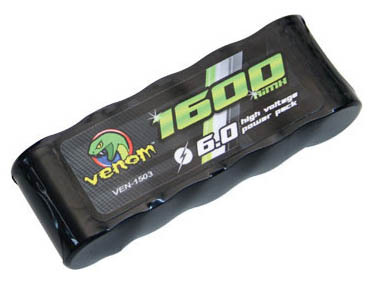 The Venom 1600mAh Flat Receiver Battery Packs are built for superior strength and optimum power performance. This battery pack feature 5 Cell, 6 Volt 1600mAh NiMH power with a high quality universal receiver plug connector. Please Note: This item can only be shipped to the U.S. (Lower 48 states only).